I found this a few weeks ago in our small town grocery store. Now, this grocery store is pretty basic and does not usually carry things that are unusual or not popular, so I was very surprised to find this there. 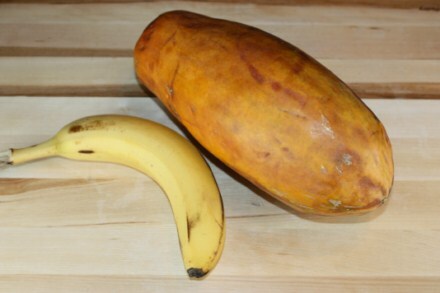 Here is it next to a banana, so that you can see the size of it. Papaya ? Yum. Love Papaya. over ripe spagetthi squash? or a mango? Papaya? I have never bought one but I am scared. I don’t know how to cut them or anything. Looks like a papaya to me! It looks more like a paw paw to me, but I’ve never seen one in a store. It’s a papaya. My grocery store sells huge papayas that are as large as a person’s head. My first thought was some sort of pear, but man, that size really throws me. Do Papayas get that big? Looks like papaya to me as well. Our store have been having a lot of them and the price is fairly good, so we have been having them every week or so. It sort of looks like an overripe champagne mango! laura, they can get much much larger than that. I vote papaya as well. Papaya – I think you just cut it open and scoop. Maybe just go to You TUbe and search for a video on papaya. You Tube has got videos on every topic. 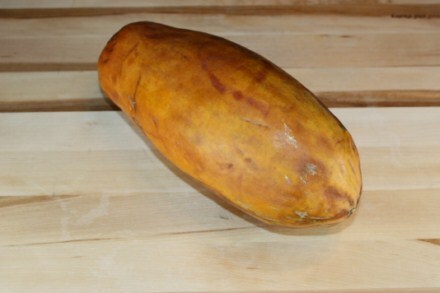 It is a papaya from Mexico. Yummy! A papaya past it’s prime, certainly very ripe.